The Philippine military is using psychological warfare to stoke paranoia inside the New People’s Army [NPA] by claiming that army agents have infiltrated the communist rebel group. Whether true or not today, the U.S., led by the late Colonel James Nicholas Rowe, did infiltrate the N.P.A. in the 1980s. The military blames N.P.A. 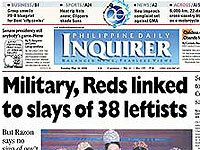 purges for most of the 123 deaths of leftist leaders and sympathizers. But a National Police task force is taking a more diplomatic approach by saying that the military and paramilitary groups as well as the communist rebels themselves may have had a part in the killings. All of these groups are suspected of involvement in the killings though they have not been formally linked to any of the murders, Deputy Director General Avelino Ignacio Razon Jr., of the Philippine National Police, who is leading a task force investigating the spate of killings, told the Philippine Daily Inquirer. Army generals on Monday blamed the killings on an N.P.A. purge, citing examples of a similar event during the 1980s. The Philippine Army has in the past blamed the deaths of some prominent journalists on the communist rebels amid evidence that President Gloria Macapagal Arroyo’s administration was increasingly cracking down on dissident journalists. The communist rebels this morning blamed military death squads for the death of 93 People First faction leaders in the past five years. The N.P.A. was formed in 1969, a year after the Communist Party of the Philippines broke away from the Philippine Communist Party, better known as PKP-1930, to fulfill its stated goal of overthrowing the government through sustained guerrilla warfare. China allegedly supplied them in their early days, but evidence of any recent support is scarce. Since Mrs. Macapagal took office in 2001 through the controversial protest known as Edsa II, the ranks of the communist rebels is estimated to have swelled to more than 10,000. These and other communist factions have sophisticated networks in rural as well as urban Philippines. The N.P.A. targets Philippine security forces, state and local officials, journalists and local businesses and funds itself largely through donations and “revolutionary taxes.” The C.P.P. and the N.P.A. are on the U.S. State Department’s list of Foreign Terrorist Organizations. The breakaway Revolutionary Proletariat Army-Alex Boncayao Brigade [RPA-ABB] runs the deadly urban hit squads known as “sparrow units” that have targeted government officials and military officers. The ouster of U.S. forces from the Philippines is another goal of these factions, who in the past have been infiltrated by government agents working with the U.S. military and the U.S. Central Intelligence Agency. U.S. Army Colonel James Nicholas Rowe, who set up the infiltration program for the Defense Intelligence Agency [DIA] and the C.I.A., was assassinated by suspected N.P.A. assailants on April 21, 1989. Col. Rowe was famous for escaping a Viet Cong prison after five years in captivity. He designed the original search, evasion, resistance and escape [Sere] courses and was reactivated as chief of the Joint U.S. Military Advisory Group in Luzon to infiltrate the N.P.A. Circumstances leading to his death — whether the U.S. intelligence agencies allegedly downplayed threats to his life — are still being debated.